The church faces busy Morris Park Avenue. To the right is the intersection with Holland Avenue. The parish schools of Our Lady of Solace parish and St. Dominic have closed. 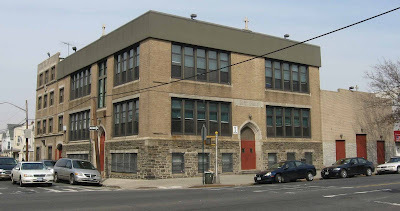 The religious education program of both parishes is apparently conducted in this building at the corner of Morris Park Avenue and Holland Avenue. See page 481 for the establishment of Our Lady of Solace in 1903. 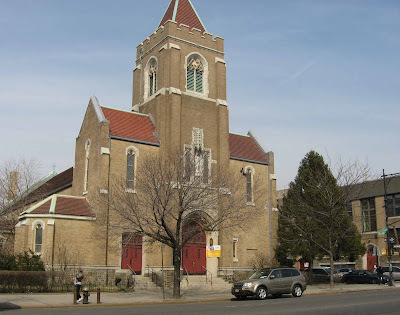 The rectory address is 731 Morris Park Ave., Bronx NY 10462, telephone 718-863-3282. Morris Park was the name of nearby race track, and Van Nest a nearby railroad station that gave its name to a housing subdivision west of Morris Park. The present church was dedicated in 1929. For years, the Sisters of the Presentation staffed the parish school. 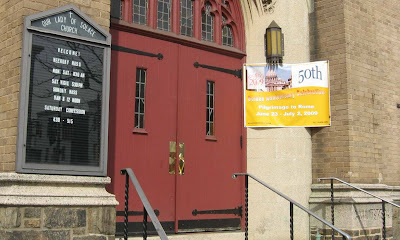 From the banner in front of the church, it would seem that the parish of Our Lady of Solace is staffed in part by Misioneros Idente, also known as Institute Id of Christ.